The DMRBIA website is a hybrid DHTML-PHP design with the base operating in HTML for simplicity with SQL databases and PHP programs to support the member databases and services. The core site was launched in August 2007, with a three year total project to implement more advanced features. At launch, the site hosted mamber listings driven by a dynamic PHP/SQL listing tool, multi-view PHP calendar, simple and more advanced public polls, and a memebr job/lease posting service. Future features will expand and improve on these, as well, a private interactive members area will be developed. Visit the site today. 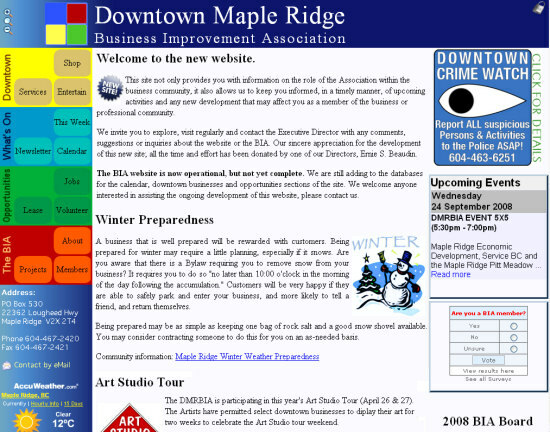 The DMRBIA used this website until summer of 2010 when a grant through the municipal government allowed a full redesign which adopted some the municipal web culture. The association's logo and web presence was brought into line with the government website - though it is listed as an independent organization.